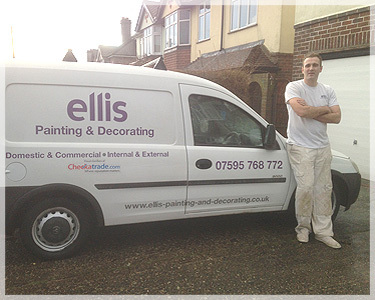 ellis Painting & Decorating – Painters and Decorators in Surrey. ellis Painting and Decorating offers a professional painting service at a competitive price across Surrey, Sussex and London. Looking for a local painting and decorating company you can trust to get the job done? Based in Redhill, Surrey we cover all the local towns and provide our services further afield in Sussex and London. We provide both interior and exterior decorating for domestic and commercial properties using the best products and tools to ensure the very best finish. I am fully qualified as a painter and decorator to GNVQ level 2 and also hold a CSCS skills card which enables me to work with major painting and decorating contractors on large projects and new build developments. I have a sound knowledge on health and safety requirements for site work and commercial decorating projects. ellis Painters and Decorators have excellent communication skills – an essential tool for working alongside project managers, site managers, contractors and other trades. Customer service and attention to detail are paramount to keeping our customers completely satisfied. As a partner of checkatrade all my painting and decorating work is closely vetted by them so I can offer the customer piece of mind. If you’re looking to start any painting or decorating work in Surrey, Sussex or London, large or small jobs, or just need some friendly expert advice please do not hesitate to contact ellis Painting and Decorating Services in Redhill, Surrey. All work is insured up to a million pounds with Covea insurance. Read genuine reviews from happy customers on checkatrade.